I became aware of these remarkable fonts when planning a church spotting trip with a fellow enthusiast early in 2014. 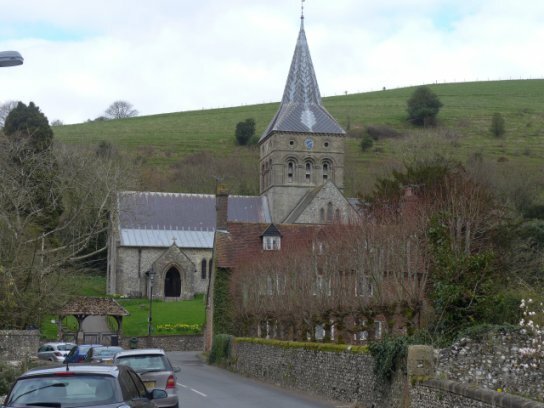 Our day trip ended up at All Saints, East Meon. A very fine church - here it is. 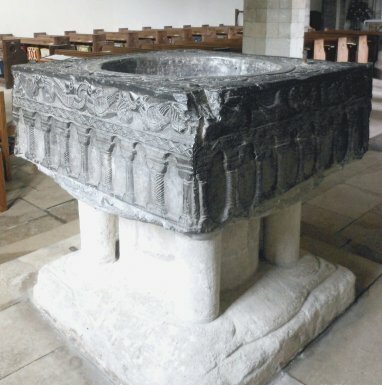 There are four Tournai fonts in Hampshire, similar in size and general appearance but with very different iconography. Having finally got round to them all, a posting is needed! Tournai is a historic city in southern Belgium, near the French border. Tournai stone is a hard, black limestone very suitable for carving, and workshops were established here back in the 10th century to exploit it. Around 1150, Henry de Blois, the Bishop of Winchester purchased some of these fonts as gifts for churches in his diocese. It has been suggested that Flemish merchants brought them to England and put them up for sale, perhaps at the St Giles fair in Winchester. There are three other examples in England, in Lincolnshire and Ipswich, Suffolk, locations appropriate for Flemish trade. These are to be found at All Saints East Meon, Winchester Cathedral, St Michael's Southampton, and St Peter's, St Mary Bourne. Let's look at them one by one. The South and West faces of the font show the creation of the world, a world held up on pillars with strange creatures roaming above. The details below show splendid dragons, and a rather more humble bird and rabbit. It is all too easy to assume that the narrative moves from left to right, but it is necessary to read it right to left. God, on the extreme right, creates Adam with a touch. Move to the left and God is creating Eve from Adams rib. But oh dear - in the next scene Eve, already clutching her fig leaf, takes the apple from the snake. In the final scene Adam is clearly enjoying the apple. Again, read the story from right to left. An angel is throwing Adam and Eve out of Eden, shown as a rather elaborate building. This has the appearance of a church and thus adds an additional layer of meaning. To the left a glum looking Adam and Eve have to work for a living - Adam is digging and Eve is spinning, though it seems that Adam needs a little instruction on how to dig from a helpful angel. So why this scene? The font portrays the source of original sin, which baptism redeems.